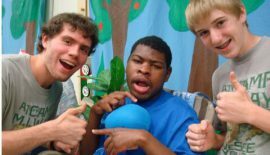 If you are interested in providing these opportunities for someone you know with disabilities that effect or limit their ability to interact or communicate with the people they know and control the environment around them, contact us to determine which activities best fit your needs and budget. Camp MI Way- Campers attend camp twice a week for a two hour block. Camp times included both a morning or afternoon option. Once assigned, the campers must remain in their block to facilitate consistency and staffing ratios. There are three weeks of camp. Other camp timelines are available on request. Switch-A-Thon- Pledges are solicited and collected throughout the week via a brief (approximately one minute) interaction between a Switch-A-Thon participant and a potential sponsor. A minimum of five sponsors are to be contacted. Competition takes place within a ten minute period. Collection of pledged money can vary from individual contact (which facilitates bragging rights regarding the number of hits made) to a collection table posted in the hallway, cafeteria, etc. or a drop box. This can be decided in the planning stages. All of our activities use volunteer partners as coaches, camp counselors and/or cheer captains. All recruitment of volunteers is our responsibility. These volunteers are recruited from a variety of sources, which include but are not limited to: the community, parents, volunteer groups, etc. In the past, many of our coaches have been on staff at the facility hosting our programs. They have included people from the following areas: custodial, cafeteria, office, classrooms, etc. This is done on a completely voluntary basis and is coordinated with the volunteers free time availability. It is an exciting opportunity to promote and in many ways, is a natural outgrowth of previous relationships between staff and the participants in our programs. Some have suggested that the fun, competitive spirit that accompanies our activities improves the overall atmosphere of the work environment. If you are interested, you must first choose an activity. We recommend starting with Switch-A-Thon or Camp MI Way. These activities can be done independent of the other programs but they will give you a good feel for what we have to offer. Once you have decided which program to begin with, we can negotiate the best dates. Note: Camp typically takes place in the summer and Switch-A-Thon typically takes place at the beginning of the school year (August/September). These are simply guidelines; you can adjust the dates to fit your needs. If you would like to have our club, camp or community service activity (one or all) offered at your location, complete the Interest Survey (found under the Forms Tab) and mail it to the address on the form.